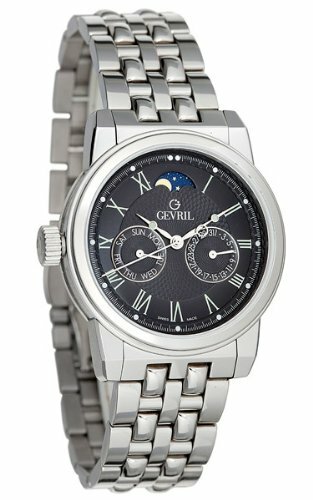 “Last year I purchased a Gevril Lexington Moonphase [watch]. “When I received the watch, I was having some health issues so I did not have a chance to look at all the paperwork for a couple of weeks. When I finally had a chance to look at the papers, I realized that the Gevril manual that was enclosed did not include the Lexington Moonphase watch, which utilizes both a quartz movement for the hour and a manual movement for the Moonphase. “At that point I contacted both [the seller] and Gevril Customer Service to obtain the proper manual. I arranged with Gevril to have a manual mailed to my address in San Diego from [Gevril worldwide headquarters] in Valley Cottage, NY. “Not only did I receive the proper manual — I also received an e-mail from Michela Bonincontri of Gevril Customer Service asking me if I had received the item, which [she had] sent via express mail. “When I had a problem setting the Moonphase, something to do with large fingers and a rather small watch crown, Michela was able to take me through the process step by step, since she owned a Lexington, as well. By the way, a really cool watch! !